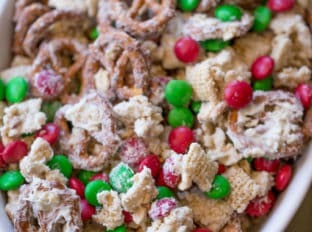 Christmas White Chocolate Trash Snack Mix has been a favorite holiday gift of mine for many years (since the first time I bought a small container of it for $$ from a local department store and was hooked on it!). 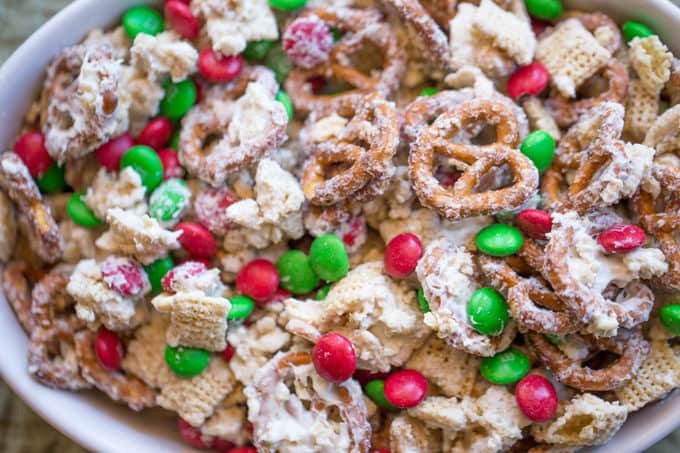 White Chocolate Trash Snack Mix is a no bake, microwave friendly recipe which takes just five minutes to make in one large batch. 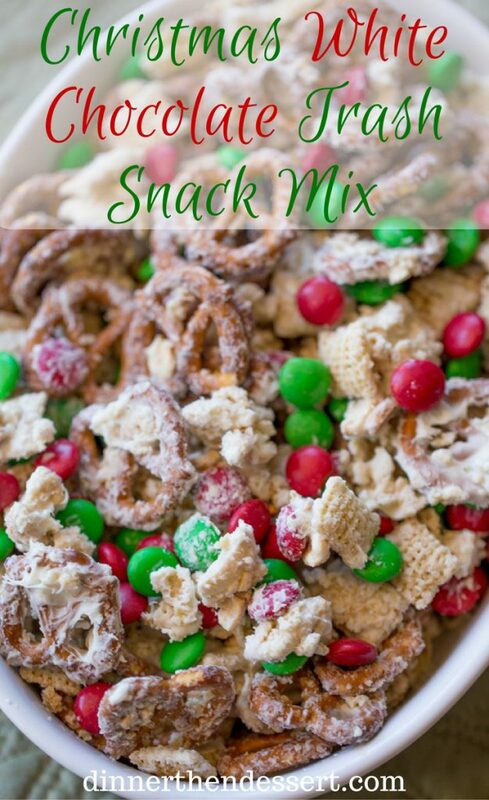 Everything but the white chocolate goes into the trash bag which is shaken for just a couple of seconds and then a second shaking of the bag with the melted chocolate added makes a HUGE batch of delicious snack mix with no cleanup! The best part is that with strong trash bags you won’t have to worry about any tears (can you imagine that kitchen mess?!) or the top opening up thanks to the break resistant drawstring. 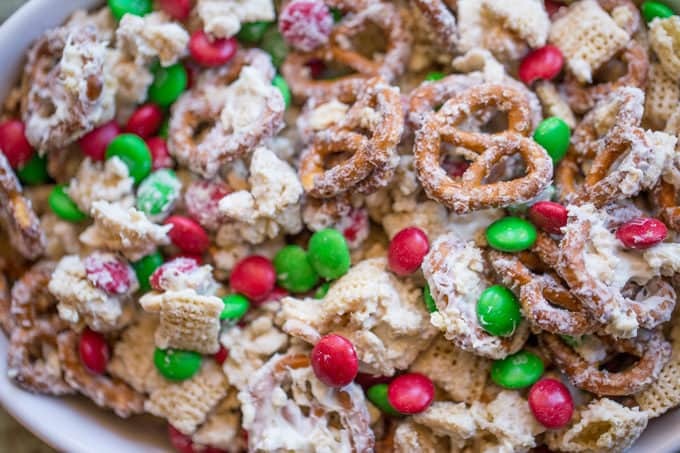 You can add almost anything you’d like to this Christmas White Chocolate Trash Snack Mix but the classic recipe is attached. I have added raisins or cranberries in the past as well as different shapes of pretzels (I find sticks are pokier than the mini pretzels which are much more friendly to bag up in gift bags. If you’re looking for a Halloween version simply swap out the chocolate coated candies for brown and orange versions (you can even add in yellow). Save yourself lots of money and make a huge batch yourself, you’ll be glad you didn’t decided on baking cookies for everyone instead. Plus, it is the perfect snack because the white chocolate helps keep the snack mix from getting stale. When Hefty originally approached me back in the summer with the idea of incorporating trash bags into recipes I had a list of five awesome recipes I wanted to make with them including the Shrimp Boil from a few months ago. I know most people think of the obvious uses for trash bags and others get creative, crafting with them. For me everything revolves around the kitchen and when you are used to cooking in large quantities a good quality trash bag is a HUGE lifesaver when it comes to prep. In smaller doses people routinely use sandwich or even gallon sized bags for adding ingredients, marinating and more. When you’re cooking for 50, a clean and sanitary option larger than the largest mixing bowl is essential to your kitchen! White Chocolate Melting Candy: Melts great, doesn’t burn, a total pleasure to work with. Christmas M&Ms: Any color combo will do, you can customize to your desired holiday or occasion. Hefty Trash Bags: Makes this recipe a total breeze to make and clean up after! Melt the white chocolate in a microwave safe glass bowl in 30 second increments until full melted. 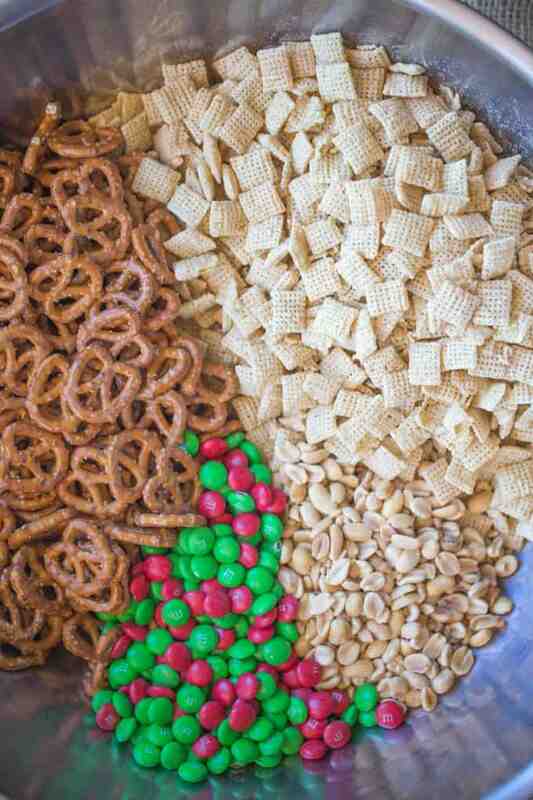 Add the cereal, pretzels, ¾ of the chocolate candies (reserve some for sprinkling on top so the red and green color stands out) and peanuts to a large trash bag. Close and shake the bag for a few seconds to mix the ingredients. Open the bag and add the melted chocolate. Close the bag again and shake until fully coated, about 30 seconds. This post was generously sponsored by Hefty. All opinions are my own. Hi! 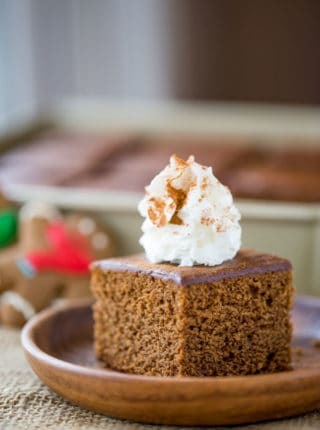 I am going to make this this weekend. Thanks for the recipe! The recipe has listed “large box of rice cereal” – rice cereal seems to come in 12 oz boxes, or “family size” 18 oz boxes. Can you tell me which size is meant? I used a 12 oz box for this recipe. Enjoy! Thank you so much!! Have a wonderful weekend! Did you have to increase the amount of the white chocolate chips to cover what you added? 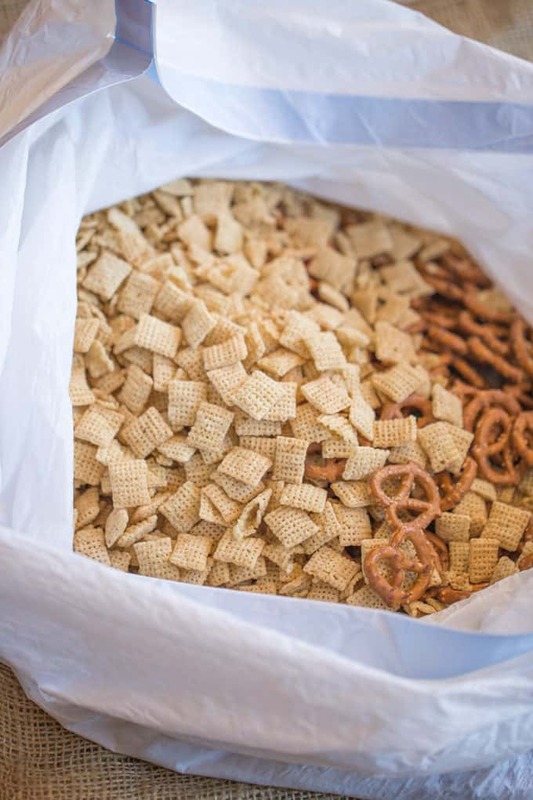 How many oz is a big box of Chex cereal? How many OZ for the Chex cereal I bought the 20 18 Oz box. Is this okay? I’m not sure. It gets eaten here so fast that there are never any leftovers. Enjoy! What would be the best substitute for peanuts? I have a peanut allergy but can eat other kinds of nuts. Just not sure what might taste best. I would recommend cashews or almonds. Enjoy! It’s a total of 20 ounces. You’ll need 2 bags since each bag is 10 ounces. Hope this clears up any confusion. Enjoy! To each if my friends. How early can I make this and still have it fresh? Best way to store it. So sorry I’m just now seeing this. If you store it in sealed containers, I would think it would stay fresh for at least up to a week. 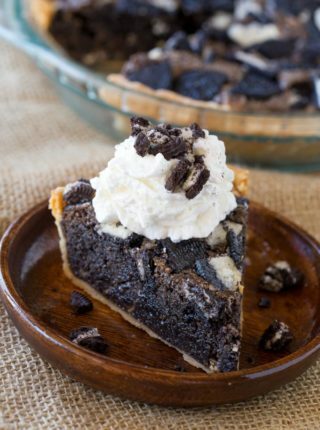 I’m about to make This. Wondering would it store well in the freezer till Christmas!?? 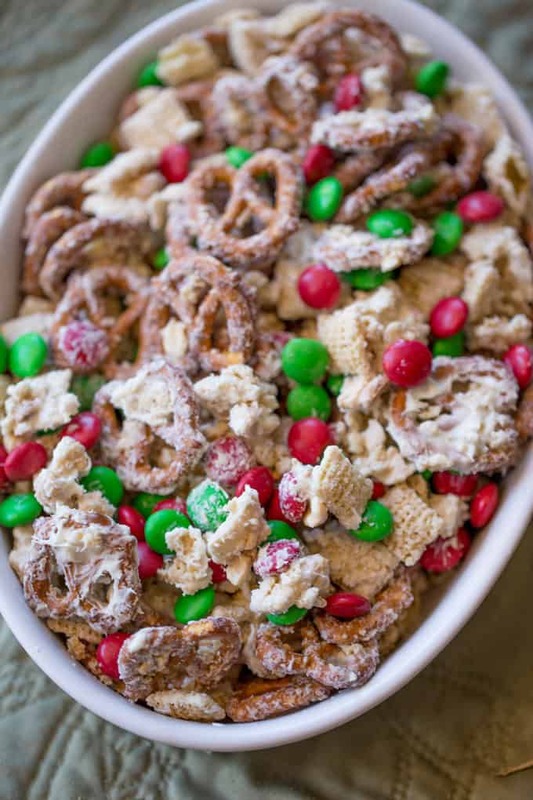 Or would the chex n stuff be a bit soggy when it re thaws. I’ve never tested it but I would think it would get soggy after thawing. I can’t imagine that the Hefty bags are food-safe. Can this be a problem when making the mix for a school carnival where everything has to be prepared in food-safe bags? Love that addition! I’m so glad you enjoyed it! Using a trash bag for mixing this is a great idea! Although, the Hefty Ultra Strong bags you are promoting only come scented. The scent will transfer to the food. Found this out when we used one to toss massive amounts of salad for a work event. I am so sorry you had that experience with your work event, what a terrible waste of food because of the scented trash bags. We used the lavender scented ones and also unscented ones with no issues. 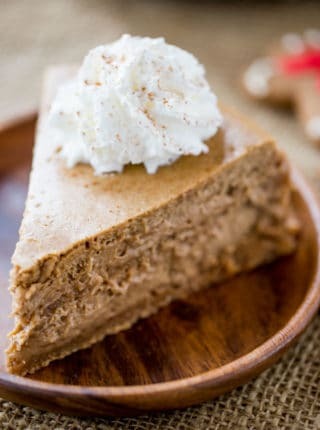 This will be my first time making this, so I’m wondering if the mix needs to be spread out to dry after it’s coated in white chocolate? Yes! You have to because if it sets in one big clump you’ll break the pieces separating them after they’ve dried. It won’t look as pretty. So glad I read the comments! It doesn’t mention spreading it out to dry in the recipe. Just made it and it’s delicious!!! Thanks for catching that! I’m not sure how that got deleted but I just added that step back in. I’m so glad you enjoyed it! I would make this again, but I wouldn’t use the white chocolate chips; I just don’t like the flavor. 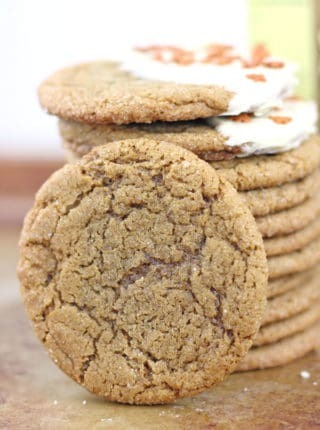 It would have been much better with milk chocolate chips or even butterscotch chips. I also added dried cranberries, which were really good in this. Definitely some great ideas to change it up! This sounds like a great idea for coworkers gifts since I’m on a very tight budget this year, but I’m curious as to what size the 24 servings are. This would be a great gift idea! Each serving size is 3/4 cup. 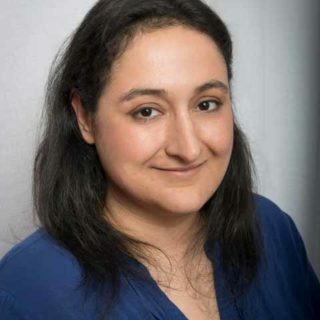 Hi Sabrina ! Thank you for this quick and easy snack. Ideal for holidays ! As somebody born on December 24, I love that you’re already thinking about Christmas! I seriously can’t wait. I LOVE everything Christmas!